Hygiene Services For Clean Teeth, Healthy Gums and A Brighter Smile Gum (periodontal) disease and tooth decay is one of the commonest global diseases and the major cause of tooth loss, with most people having some form of gum disease. Gum disease can often be controlled by good daily homecare, prevention programme and a regular professional cleaning (Scale and Polish). Plaque & tartar is a major cause of gum disease. A professional cleaning can not only remove plaque and tartar to help to achieve healthy gums, but also most external staining from your teeth to help give a much cleaner, brighter smile. We assess the condition of your gums looking for inflammation, bleeding, plaque and tartar. Carry out a professional cleaning which includes a scale and polish to remove plaque, tartar and stains. Advice you on a daily homecare routine and oral health products to help you maintain good plaque control and minimise future tartar build up. Clean your teeth twice a day, morning and night, spending a few minutes. Brushing with an electric (power) toothbrush will allow maximum effect. 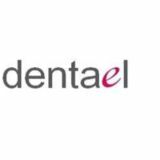 Clean in between your teeth using floss or interdental brushes. Clean your tongue with a toothbrush or tongue cleaner. Replace your toothbrush every 3 months. Remember to have your teeth professionally cleaned regularly to maintain your smile. 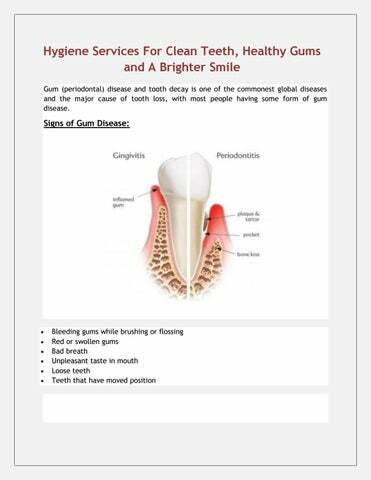 The main cause of gum (periodontal) disease is plaque, but a number of other factors affect the health of our gums. These include smoking/tobacco use, genetics, age, stress, medications and systemic diseases such as diabetes and cardiovascular disease. Our mouth is also the gateway to our body. Good oral health is integral to good general health. Recent research studies show gum disease can put us at a higher risk to general health problems such as heart disease. How is this so ? There are hundreds of bacteria that inhabit our mouths. One theory is that gum disease allows these bacteria to enter the bloodstream and circulate around the body allowing them to settle in the heart blood vessels. Research has also shown some links between gum disease and stroke, respiratory disease, head and neck cancer, kidney disease and diabetes.